Here's a snapshot of our new outdoor classroom structure and bridge. The bridge serves as a great viewing platform for students to see the stream and connects to our learning trails. Our outdoor structure offers a protected area for students to gather for year-round instruction regardless of the weather. A special thank you to Lacey Construction and their amazing crew for building us such a spectacular structure! Thanks also to Tom Cassel & Ian Kerr (TW Excavating) for the bridge work and to the MacLean's who volunteered their time to help with the install. Thank you to Inch Creek Hatchery for coordinating our fish release on April 20, 2018. This was a very rewarding day for students as they released over 40,000 Chum Salmon into our school stream as part of our "Forest & Stream" Rehabilitation and Stewardship Program. It was great to have so many people come out for the event and join us for our Stream Dedication Ceremony. Unique to Deroche Elementary is our "Forest & Stream" Stewardship Program. We have a stream running through our school property which has given us a remarkable site to teach students ecology, environmental studies, aquatic life and the importance of watershed sustainability. We invite you to come for a visit and check out our "Forest & Stream" Program! 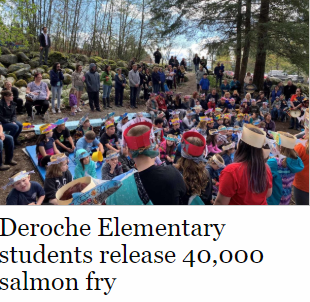 On April 12th, 2019 students, parents, guests and staff released another 40,000 Chum Salmon into our school stream. It was an amazing day! We had a ceremony by the stream followed by a ribbon cutting to honour our "Forest & Stream" supporters, followed by a special luncheon. Thank you to DFO/Inch Creek for making this day possible and thank you to all the parents, community members and dignitaries who came out to enjoy this special day with us! Our Running Track is Finished!! In the Spring of 2018, our school received a grant from our School District to build a 200 meter five lane running track. We are very excited to have another venue to do our Daily Physical Activity programs and to allow our children to see improvement in their running times. We hope to host some running meets with other schools from Mission School District as well as Aboriginal schools operating east of our school. Finally, we are happy that this track could serve a place for our local community to walk on in the evenings. We are super excited to announce that our new playground has been installed! Thank you to our hard working volunteers who spent a full weekend in October to help with the construction, including our new PAC, school staff, members of the North Fraser Fire Dept and Sasquatch Lions Club. We couldn't have done it without you! Thanks also to our Grounds Department for helping with the site prep work, to Tammy at SwingTime, and to the Provincial Government for helping fund the project. Gr 6 students will have the opportunity to go to Hatzic Middle School for the day as part of their transition to middle school. Last Day of School for Students. Have a Fabulous Summer! ​Make sure you check out our Information Page for our weekly news bulletins! 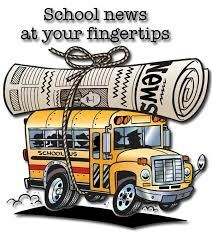 This is a great way to keep up-to-date on what's happening at the school.